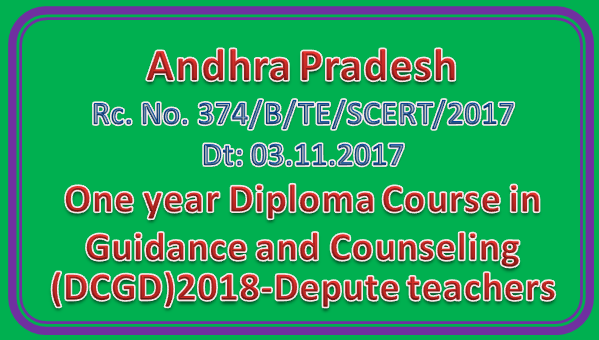 Sub: S.E- SCERT, AP- One year Diploma Course in Guidance and Counseling (DCGD)2018-Depute teachers -Req-Reg. Ref: F.No. 18.36/DEF/RIEM/2017-18DT:03. 11.201 7from the Director RIE, Mysore. WhiLe communicating a copy of reference along with brochure read above, all the District EducationaL Officers in the State are informed that the Director, RegionaL Institute of Education, Mysore has informed that the National Council of Education Research and Training (NCERT) is offering a one year Diploma Course in Guidance and Counseling (DCGD) for preparing teacher counselors for schools and allied setting. In this regard, they are requested to depute the willing teachers who have genuine interest and motivation to act as teacher counselor and issue necessary instruction to the interested teachers to send their application to the Principal, Regional Institute of education, Mysore or e-mail to riemysorecrediffmail.com on or before 10th November, 2017 under intimation to this office.